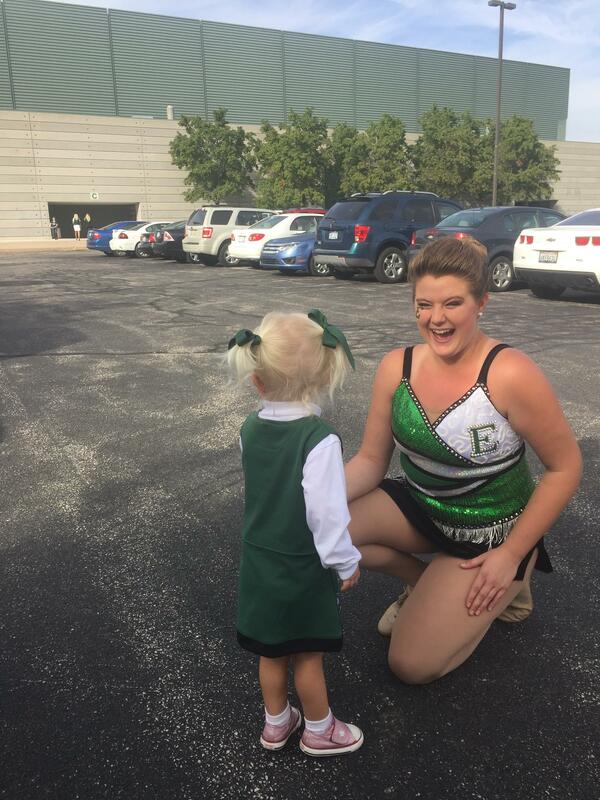 This week for Twirler Tuesday, we are happy to introduce you to Kaitlyn Thorpe from Eastern Michigan University. Kaitlyn is a second year and is studying chiropractic medicine. Check out some of the great insight she has to share about her time at Eastern Michigan. CMB: What made you want to twirl in college? KT: Twirling in college has been my ultimate goal ever since I started twirling at 8 years old. I grew up attending every local football game, absolutely fascinated by the Marching Band. At such a young age I already felt that growing passion in my core. I knew that I wanted to take Twirling as far as I possibly could; the collegiate field. I saw how much of an impact a twirler can have on so many lives such as other twirlers, fellow band members, and spectators varying in age,and I definitely wanted to take advantage of that; to showcase my sport, my talent and to represent not only myself, but my coach, Tammy Albrecht, my competitive team, Limited Edition, and most importantly, my family. CMB: What is your twirling background? KT: I have been twirling competitively for 12 years now, individually as well as on a Team, Limited Edition, based out of my hometown, Brighton, Michigan. I have won many Titles, but the most memorable was winning the 2013 Junior Olympic Games National Championship, as well as bringing five Gold medals home. What an amazing feeling it was to bring those gold medals home to the state of Michigan! I am an alumni of Brighton High School (Go Dogs!) where I was the Feature Twirler for all four years of my High School career. Here I am now, at Eastern Michigan University, as The Feature Twirler for the "Pride of The Peninsula," in Ypsilanti, Michigan where I have absolutely fallen in love with the Band Program, the Student Body, and the beautiful historical campus! CMB: How do you prep for a game? KT: Waking up early on game day mornings are never an issue for this girl! I jump out of bed about 2 hours before call time to do my hair and make up, and of course this can't be done without blaring music to get pumped up! I make sure to eat a big breakfast to supply me with all the energy I need! When I arrive at Rynearson Stadium, the headphones go in, I begin stretching, run a few laps around the field to get my muscles loosened up, and then it's rehearsal time! Sharing some laughs with my Marching Band friends before rehearsal always fuels up my energy as well! CMB: What advice do you have for younger twirlers who want to twirl in college? KT: Never give up; hard work pays off. Trying to get through the end of your High School career while maintaining pristine grades, all while practicing several hours per day for college auditions, on top of your competitive routines can, and will be some of the most stressful times you will encounter. But with diligence, determination and focus, you will succeed in these areas. You will run into times where your friends will hang out without you, go to parties without you, take trips without you, all because you have practice or certain responsibilities you're obligated to, and from experience, that's not the greatest feeling. However, you will be working towards something so much bigger than your imagination can even comprehend, and when you can say that "you made it," nothing tastes sweeter. Keep your eye on what you're working for. Another word of advice that I'd love to share is that you do NOT have to Twirl for a Big 10 University, to "be something." You are what you create of yourself. Make your mark, where ever you decide to go. CMB: What is your favorite trick to do on the field? KT: Any kind of multiple baton! KT: River night! "Bring your towel. ;)" River night is a rich tradition of the EMU Marching Band and it is extremely sentimental to the group. CMB: What is your favorite memory so far? KT: My favorite memory thus far has to be the very first time I stepped foot on the turf at Rynearson Stadium, or as we like to call it, "The Factory." My first year with the Marching Band was the first season with the brand new grey turf in Rynearson Stadium. Equivalent to this, has to be Eagle Strutting out of the tunnel for pre-game the very first time and hearing my name echo through the stadium as I was announced. This was such a powerful moment and really made me realize that everything I had worked for, has now become a reality. CMB: Anything that you would like to share with the fans of CollegeMarching? KT: Without Marching Bands, Twirlers all around the country would not have beautiful music to showcase our talents with! It is our job, along with the Color Guard, to make your music a visual art. It is a team effort and I wanted to thank all Marching Bands near and far, for doing what YOU do! I would love to thank all of the people that helped me get to where I am today. My coach, Tammy Albrecht, my High School Band Director Gabrielle Hoffman (Brighton High School), Eastern Michigan University's Band Director Dr. Amy Knopps, and my family for being my #1 support system and being there at each and every game, rain or shine! Love and Honor to all <3 GO GREEN!